This topic contains 6 replies, has 5 voices, and was last updated by The Australian 5 years, 8 months ago. VAT on new homes went up to 10pc at the start of this year (and VAT on refurbishments went up from 8pc to 10pc at the start of the year, if I’m not mistaken). 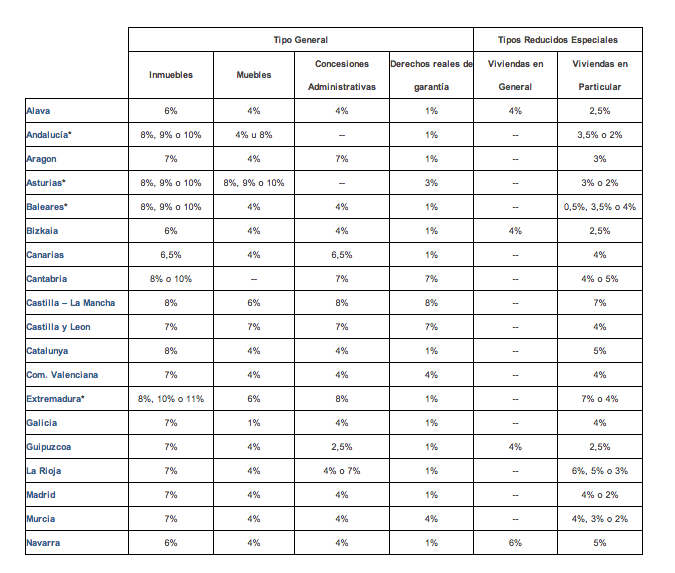 Transfer tax on resales is 10pc in most popular areas, as you can see from this table (first column, and Catalonia and the Valencian Region have just increased the ITP resale transfer tax (impuesto de transmisiones patrimoniales) from 8pc to 10pc this month). So basically, if you buy a property for €200,000 in Spain today, you’ll pay around 15pc in transactions costs (taxes, notary, stamp duty, registry office, legal fees, mortgage costs), which is €30,000. You might also get hit by a “bargain hunter” extra charge for ITP if the taxman thinks you’ve paid too little. It is truly insane to have such high transactions costs on property in the middle of a massive property crash. The government should be slashing costs to stimulate the market, not raising costs as it is doing. Check out the comments at the bottom of this article: Resale transfer tax goes up to 10pc in Catalonia & Valencian Region. Spain is going to lose a lot of sales and income because of these escalating costs, and the black economy will get bigger. could you break down how you reach the 30.000€ figure? I assume that figure is based on your experience in Barcelona? Yes, based on a purchase in Barcelona and assuming a mortgage. It’s a rough figure – it might be less, but not much less. @Mark. The Spaniards don’t think it is insane !!!!!!!!!!!!!. Does anyone know what the tax on buying a resale in Florida is, roughly? For all I know, there might not even be a tax on buying a home there. There is no justification for taxing people for buying a home. Let them beg for money then.